The Stupa of Sariputta at Nalanda. In ancient India, Nālānda (Sanskrit: meaning "giver of knowledge") was a once thriving monastic-university renowned both as a center of learning and for its large library of sacred texts. Established in 427 C.E., Nalanda flourished for seven hundred years until its destruction in 1197 C.E. at the hands of Muslim invaders. The ruins of the monastery are located about 55 miles south east of the modern Indian city of Patna (coordinates: 25.135766 N 85.444923 E). Nalanda has been called "one of the first great universities in recorded history." In ancient times, Nalanda was particularly known as a center of Buddhist learning and many of its Buddhist teachings were transmitted to other parts of Asia, including China and Tibet where Buddhism continueed to flourish after its wane in India. The origin of the name Nalanda is disputed. It may derive from nalam ("lotus" -a symbol of knowledge and da, (to give). The Chinese pilgrim-monk Xuanzang gives several explanations of the name Nālandā in his writing. He remarks that the origin of the word may come from the "Naga" (semi-divine serpent beings) who lived by a pool of water in the middle of a mango grove. Another hypothesis, accepted by him, is that the Bodhisattva once had his capital here and gave "alms without intermission," hence the name. The Buddha is mentioned as having several times stayed at Nalanda. When he visited Nalanda he would usually reside in Pāvārika's mango grove, and while there he had discussions with Upāli-Gahapati and Dīghatapassī, with Kevatta, and also several conversations with Asibandhakaputta. The Buddha visited Nālandā during his last tour through Magadha, and it was there that Sariputta uttered his "lion's roar," affirming his faith in the Buddha, shortly before his death. The road from Rājagaha to Nālandā passed through Ambalatthikā, and from Nālandā it went on to Pātaligāma. According to the Kevatta Sutta,  in the Buddha's time Nālandā was already an influential, prosperous, and populated town, though it was not untill later that it became the centre of learning for which it became famous. There is a record in the Samyutta Nikaya,  of the town having been the victim of a severe famine during the Buddha's time. Sāriputta, the right hand disciple of the Buddha, was born and died in Nālandā. In the religion of Jainism, Mahavira is several times mentioned as staying at Nālandā, which was evidently also a centre of activity of the Jains. Mahavira is believed to have attained Moksha at Pavapuri, which is located in Nalanda. The Digambar sect of Jainism also teaches that Mahavira was born in the nearby village of Kundalpur. King Ashoka (250 B.C.E.) is said to have built a temple in Nalanda. According to Tibetan sources, Nagarjuna also taught there. Nalanda was one of the world's first residential universities as it had dormitories for students. Historical studies indicate that the University of Nalanda was established 450 C.E. under the patronage of the Gupta emperors, notably Kumaragupta. In its heyday, it accommodated over ten thousand students and 2,000 teachers. The university was considered an architectural masterpiece, and was marked by a lofty wall and one gate. Nalanda had eight separate compounds and ten temples, along with many other meditation halls and classrooms. On the grounds were lakes and parks. The library was located in a nine storied building where meticulous copies of texts were produced. The subjects taught at Nalanda University covered every field of learning, and it attracted pupils and scholars from Korea, Japan, China, Tibet, Indonesia, Persia and Turkey. The Tang Dynasty Chinese pilgrim Xuanzang left detailed accounts of the university in the seventh century. A vast amount of what is considered to be Tibetan Buddhism (Vajrayana) actually stems from the late (ninth-twelfth century) Nalanda teachers and traditions. Other forms of Buddhism, like Mahayana found in Vietnam, China, Korea and Japan, found part of their genesis within the walls of this ancient university. Theravada Buddhism was also taught at Nalanda University although it seems that Nalanda was not a strong center of Theravada. Due to the disappearance of Buddhism from India during the twelfth century, the university was in decline. 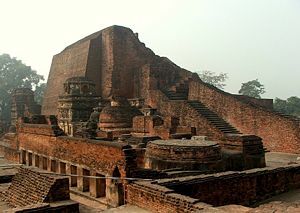 In 1193 C.E., Nalanda University suffered a final blow after the complex was sacked by Muslim armies under Bakhtiyar Khilji; this event is seen as a milestone in the decline of Buddhism in India. When the Tibetan translator Chag Lotsawa later visited the site in 1235, he found it damaged and looted, but still functioning with a small number of monks. Ahir blames the destruction of the temples, monasteries, centers of learning at Nalanda and northern India for the demise of ancient Indian scientific thought in mathematics, astronomy, alchemy, and anatomy. Ling and Scott, however, point out that centres of learning were already declining, before the presence of Muslims armies. Fortified Sena dynasty monasteries along the main route of the invasion were destroyed, and being off the main route both Nalanda and Bodh Gaya survived. Many institutions off the main route such as the Jagaddala Monastery in northern Bengal were untouched and flourishing. Wide view of the other (back)side of Sariputta's Stupa. A number of ruined structures in Nalanda still survive today. The excavated ruins extend over an area of about 150,000 square meters, although if Xuanzang's account of Nalanda's extent is correlated with present excavations, almost 90 percent of it remains unexcavated. Nalanda is no longer inhabited. Today the nearest habitation is a village called Bargaon. In 1951, a modern center for Pali (Theravadin) Buddhist studies was founded nearby by Bhikshu Jagdish Kashyap, the Nava Nalanda Mahavihara. Presently, this institute is pursuing an ambitious program of satellite imaging of the entire region. The Nalanda Museum contains a number of manuscripts, and shows many examples of the items that have been excavated. On December 9, 2006, the New York Times detailed a plan in the works to spend $1 billion to revive Nalanda University near the ancient site. A consortium led by Singapore and including China, India, Japan and other nations will attempt to raise $500 million to build a new university and another $500 million to develop necessary infrastructure. On June 12, 2007, News Post India reported that the Japanese diplomat Noro Motoyasu said that: "Japan will fund the setting up an international university in Nalanda in Bihar." The report goes on to say that "The proposed university will be fully residential, like the ancient seat of learning at Nalanda. In the first phase of the project, seven schools with 46 foreign faculty members and over 400 Indian academics would come up." … "The university will impart courses in science, philosophy and spiritualism along with other subjects. A renowned international scholar will be its chancellor." ↑ Anant Sadashiv Altekar, Education in Ancient India, 6th ed., (Varanasi, India: Nand Kishore & Bros., 1965). ↑ Jeffrey E. Garten, "Really Old School," New York Times, December 9, 2006. ↑ Shashi Tharoor, Reconstructing Nalanda, The Hindu, December 24, 2006. Retrieved October 18, 2007. ↑ Samuel Beal, Buddhism In China. (Kila, MT: Kessinger Publishing, 2006 ISBN 1428651462), ii.167f. 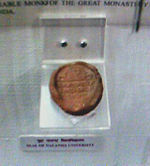 ↑ Samyutta Nikaya ii.110; Majjhima Nikaya i.376ff. ↑ Digha Nikaya ii.81f., iii.99ff. ; Samyutta Nikaya v.159ff. ↑ Altekar, Education in Ancient India. ↑ Jeffrey Hopkins, Meditation on Emptiness, (Somerville, MA: Wisdom Publications, 1996). ↑ Garten, "Really Old School." ↑ Sally Hovey Wriggin, The Silk Road Journey With Xuanzang. (Westview Press, 2003). ↑ D. C. Ahir, Buddhism Declined in India: How and Why? Delhi: B. R. Publishing, 2005. ↑ Scott, "Buddhism and Islam." ↑ Ashok K. Jha, Nalanda Int’l University: A Commendable Initiative, Merinews,May 28, 2007. Retrieved October 16, 2007. ↑ India eNews, Japan Eager To Invest In Nalanda University, June 12, 2007. Retrieved October 16, 2007. This page was last modified on 2 April 2008, at 12:53.